Our 2 in 1 twist pen and highlighter combo pen is both creative and functional. Use as a back to school promotion or a useful tradeshow giveaway. Swiss nib & German ink cartridge. With Chisel tip highlighter and twist pen. Available in silver or white body with yellow, green, blue, orange or pink highlighter. 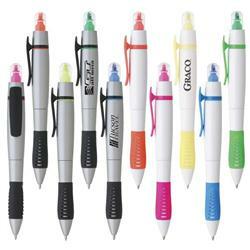 Schools, finance, real estate, and medical offices particularly love these quality custom highlighter pens. Be twice as effective with your promotional product budget with our highlighter pens by Adco Marketing. ON SPECIAL NOW AT 500 OR MORE PIECES! FREE 1-2 DAY RUSH PRODUCTION AVAILABLE! Available Colors: Silver or white body with yellow, green, blue, orange or pink highlighter. Absolute minimum is 300 pieces. Add $45. Sealed in cello-wrap for longer shelf life.